Servers will be broken down into six sections: Serving Spoons (those with a bowl), Serving Forks (those with tines), Serving Knives (those with blades), Serving Sets (combinations of servers or serving and place pieces), Ladles (bowls again! ), and Miscellaneous Servers (everything else!). Identifying the original use of a server can sometimes be difficult, especially if one does not have the manufacturer's catalog. As a consequence we may have just what you need listed under a completely different category than what you might expect. Thus it is hoped that having a separate page for these six broad groupings of servers will enable you to search through somewhat similar categories that may more quickly yield what you are looking for. These sections will include post-Civil War American Servers and foreign examples of any age. There is a separate page devoted to Baltimore Repoussé Servers if that is your only interest. 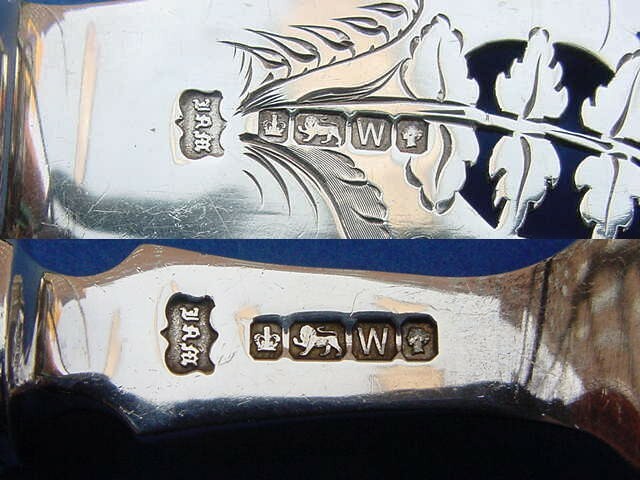 For Civil War and earlier American examples please check out Coin Silver Servers, Coin Silver Ladles, and Coin Silver Sugar Tongs. For all of our stock of 20th century handcrafted silverware please check out our Arts & Crafts Silverware. Also please check out our Place Flatware page. 1224-23. 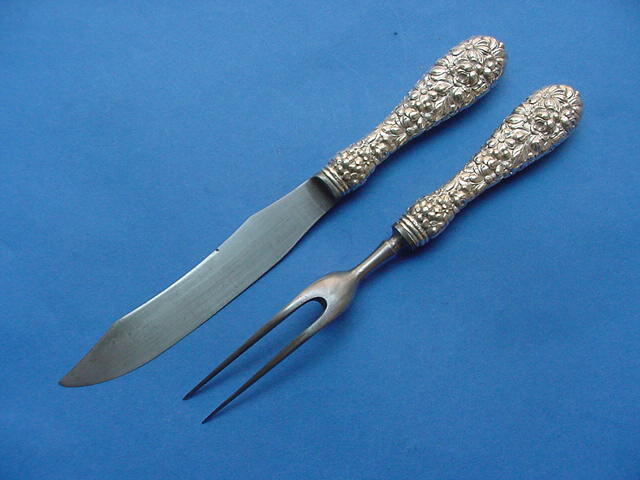 Pair Kirk 'Old Maryland' Roast Carvers with silver guards and stainless steel blades and tines, c.1950-1975. Mono "BLCC". Knife 13.88" long, Fork 11.5" long; guards 1.69" wide. $ 125. 1280-38. 4 Kirk 'Repoussé' Roast Carvers consisting of knife, fork, sharpener, and holder, c.1890-1900. Mono "JAH". 2 pieces marked "11OZ", 2 "925". These handles are actually hand chased rather than stamped. Knife 13.62" long, fork 11.5" long, sharpener 13.25" long, holder 12.12" long. 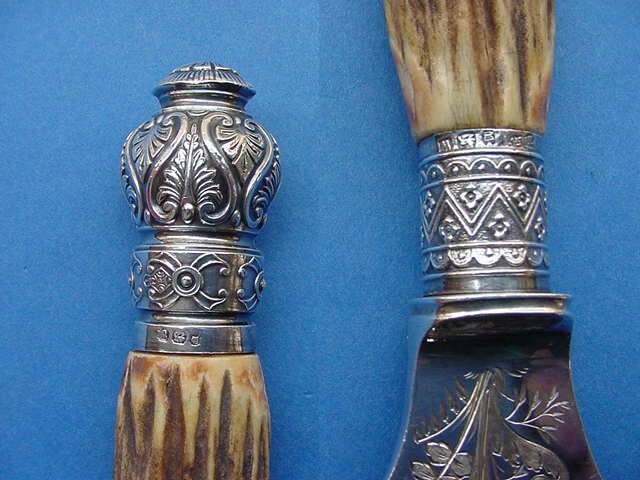 Knife blade worn, knife handle over polished. $ 600. 1401-54. 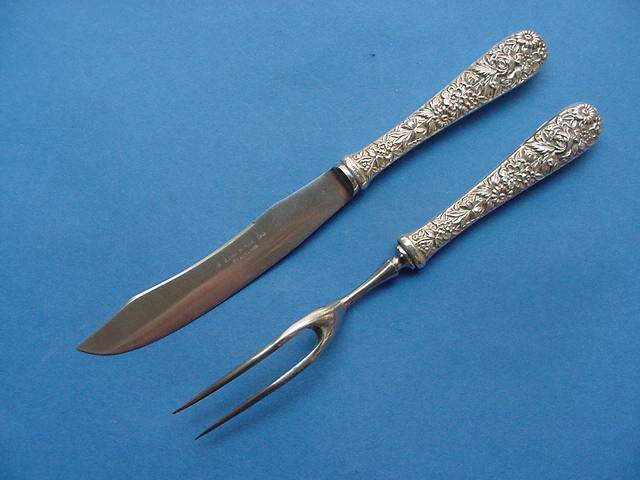 Pair Kirk 'Repoussé' Steak Carvers with stainless steel blade and tines, c.1920-1925. No mono. Knife 9.56" long, Fork 8.75" long. Knife blade with scratching from sharpening. $ 85. 1373-32. 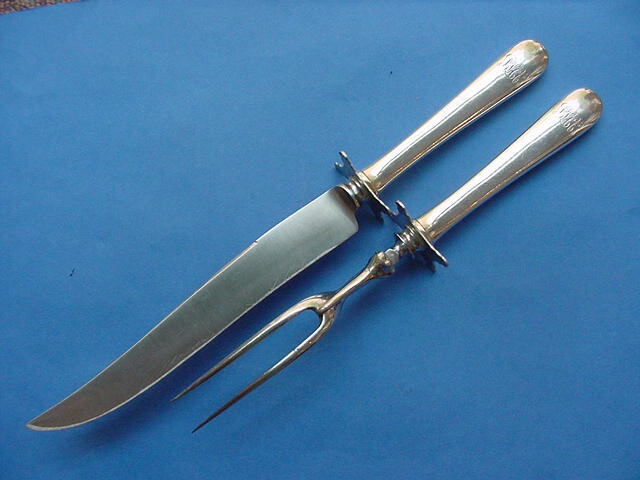 Pair Kirk 'Repoussé' Steak Carvers with stainless steel blade and tines, c.1925-1935. Mono "JS". Knife 9.5" long, Fork 8.62" long. $ 90. 1331-01. 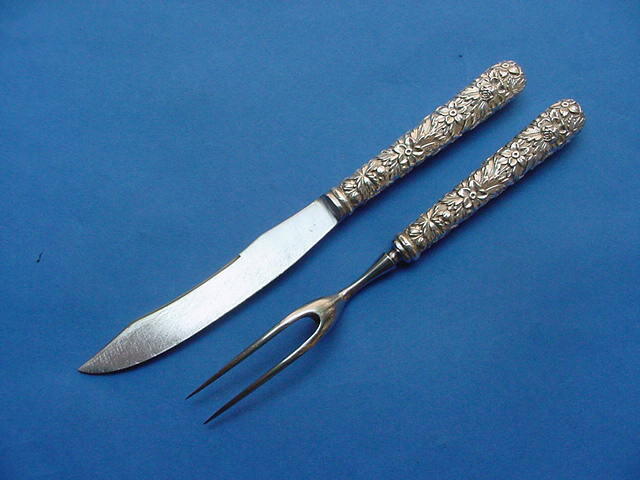 Pair Stieff 'Chrysanthemum' Game Carvers with replacement stainless steel blade and tines, c.1910-1920. No mono. Knife 10.12" long, Fork 8.69" long. $ 85. 1286-23. Pair Stieff 'Rose' Game Carvers with carbon steel blade and tines, c.1915-1930. No mono. Knife 9.38" long, Fork 8.38" long. $ 60. 1533-26. 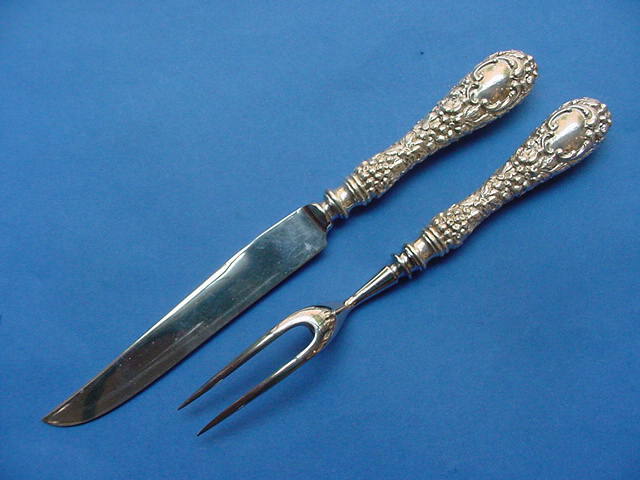 Pair Antique Victorian Silver Fish Servers with antler handles, the blade and tines pierced and engraved with floral decoration; marked by John Newton Mappin for Mappin & Webb at Sheffield in 1888/90, the caps also struck with a 14 March 1878 Design Registry mark. No mono. Fish Knife: 14" long, 2.12" blade width; Fish Fork: 10.5" long, 1.94" across tines; 11.9 troy oz gross total. $ 400.